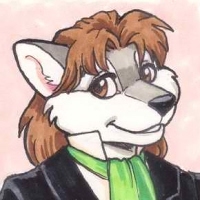 FuzzWolf has been active in the furry fandom since 1998. His stories have appeared in X, published by Sofawolf Press, two issues of FurNation Magazine and Alfurnatives. He is also the author of “Trevor’s Tricks”, an anthology of short stories featuring his fox and wolf couple. In 2008 he and his partner purchased FurPlanet Productions. FurPlanet publishes furry-themed books and comics and also produces art prints, custom card decks and CDs, including the hard copy version of the Anthro Dreams podcast. To find out more about FurPlanet, visit the store at FurPlanet and check out the submission guidelines and FAQ.